Biscuits and gravy were a major comfort home in my house growing up. I still loving making this indulgent breakfast today! The creamy sausage gravy and the warm, flaky, buttery buttermilk biscuits...there's simply nothing better! Funny enough, it's not my husband's favorite, so I get to eat all of it whenever I make it! It's a great breakfast to make for a large crowd. 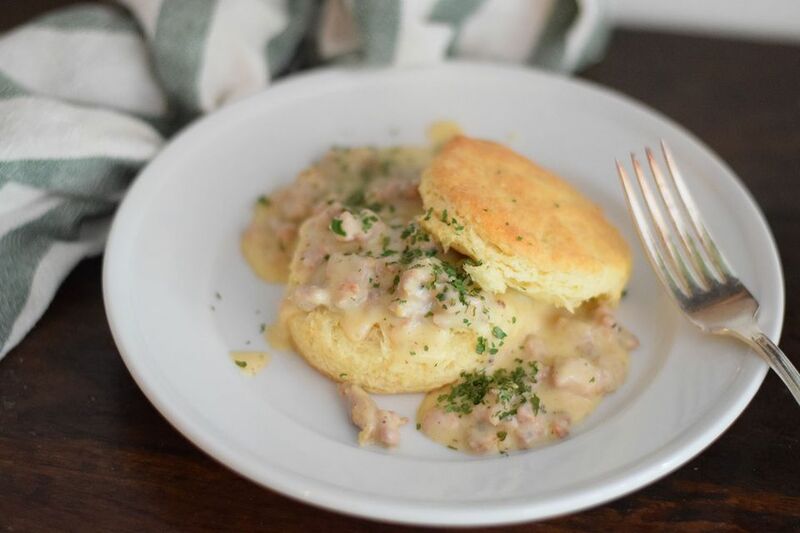 The biscuits are pretty easy to make and the sausage gravy comes together in no time. Serve the biscuits and gravy with a side of scrambled eggs and you've got a complete breakfast! The biscuits can easily be made with a bowl and two forks, but it turns out the best if you have a food processor! You want to try and touch the dough as little as possible. Heat makes the little butter cubes melt and then you won't have flaky biscuits!! I like really tall biscuits so I like to roll out the dough into a really thick sheet. This recipe will make 6-8 super thick biscuits or more if you make them on the thinner side! Combine all dry ingredients and butter in food processor, pulse until it forms fine crumbs. If you don't have a food processor use a pastry blender or two forks. Be careful not to over mix or to use your hands. You want the little chunks of butter to stay intact! Add in buttermilk as you pulse. Turn out dough onto a clean flour surface. Roll out into a thick sheet, about 1/2-1 inch thick. The thicker the sheet, the taller the biscuit! Cut using a biscuit cutter and place onto an un-greased baking sheet. Bake for 15 minutes, or until golden brown. Top with melted butter if you wish! Cook sausage in an iron skillet or heavy bottomed skillet. Break into crumbles while cooking. Let cook for about 2 minutes, stirring occasionally, until it thickens. Add pepper, salt, and season salt. Add the salt a little at a time, some breakfast sausage is saltier than others! Top the gravy onto the biscuits and dig in. Sprinkle with a little chopped parsley if you wish.